Have you ever wondered, "What is popcorn"? Nearly everybody loves the fluffy and delicious snack known as popcorn. The aroma is enough to make almost everyone's stomach growl and grab a bag, cup or bucket of the yummy treat. Whether you like it covered in butter, chocolate, toffee or some other way, popcorn is essentially one of the snacking staples in the United States and has been a staple for many centuries. The average ear of corn that you would grow in your garden will not be suitable to use as popcorn. Popping corn is different than the average sweet corn that people grow. Corn grown for popping is a totally different variety and can only be used for the purpose of making popcorn. Both popcorn and sweet corn may be delicious but each has its own preparation methods. Corn that has been grown for popping has smaller kernels. There are also spaces between them, unlike the plump kernels of sweet corn that you would boil or roast. The skin of popping corn is hard and almost shell-like, while sweet corn is tender. This hard exterior helps to keep the moisture and starch inside. Popping corn comes in numerous varieties but no matter what, they are for popping as genetically, they are a different strain from white or yellow corn. Many people believe that if you dry sweet corn, it can pop. Nothing is further from the truth, which makes people question, "What is popcorn?". The structure of popping corn kernels is what allows it to pop. Inside the round kernels is an inner circle of starch which surrounds a tiny amount of moisture. Even when dried, it is impossible for sweet corn to pop because it has a completely different genetic makeup. 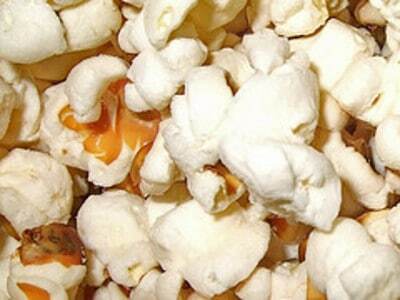 What is popcorn's key to popping? The hard, outer casing on popping corn is what helps to make it pop. Once the corn is heated, pressure builds up inside the skin. The moisture begins to get very hot and pushes against the circular starch that surrounds it. Finally, the skin can't hold the pressure and it bursts open. The starch puffs up from the intense heat and voila, you have popcorn. In summary, when asked, "What is popcorn? ", you can answer that it's a unique variety of corn that is cultivated with specific characteristics that allow it to "explode" when heated. These include a hull which seals in moisture and a dense starchy filling.